One of the crimes that prompted the “Murder in Minneapolis” map that I posted on Monday was the slaying of Walter W. Liggett, the radical publisher of the small Mid-West American. A couple of months before he was gunned down in the south Minneapolis alley behind his apartment, Liggett had predicted his own death in a letter to Chicago Tribune publisher Colonel McCormick. Liggett believed he had be…en targeted by the same gangsters who had gunned down another crusading editor–Howard Guilford–on Pillsbury Avenue in September, 1934. McCormick (a wealthy industrialist and publisher) and Liggett (a radical editor of a marginal publication that railed against vice and big banks) were strange bedfellows. But they were united in their animus towards Floyd B. Olson, the charismatic and popular governor of Minnesota who both men believed had deep ties to the underworld. 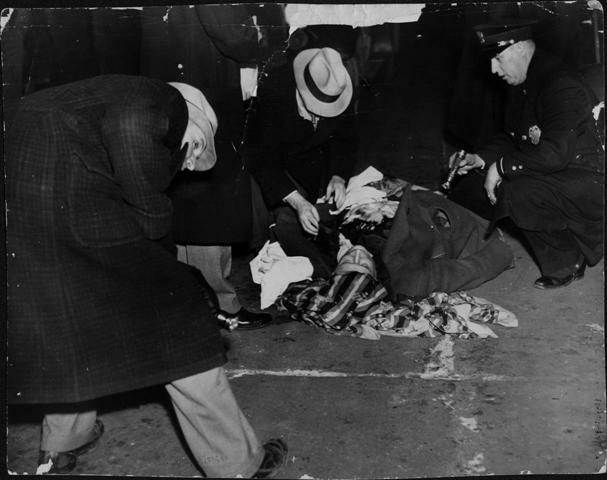 This photo from December 9, 1935 shows the Liggett murder scene at 1825 Second Avenue South, before police had removed the editor’s body. As was customary at the time, the newspaper published the grisly photo. Liggett was machine-gunned down on a wintry evening as he returned from grocery shopping with his wife and daughter, who were seated in the back seat of the Ford automobile in the background. Liggett’s wife was adamant that she recognized one of the gunmen as notorious gangster Kidd Cann. Cann was indicted for the murder but escaped conviction on the strength of testimony from a group of barbers from the Artistic Barbershop downtown, who claimed that the well-known mobster was getting a haircut at the time of the murder. Liggett’s daughter, Marda Woodbury, would later publish Stopping the Presses, a book that recounted her memories of the murder and the threats preceding this terrible moment in the cold alley. Photo is from the newspaper “morgue” files at the Minneapolis collection, Hennepin County Central Library. My thanks to intrepid Historyapolis volunteer Rita Yeada for digitizing images from this uncatalogued collection. This entry was posted in Stories and tagged 1930s, journalists, kidd cann, organized crime, Walter Liggett.